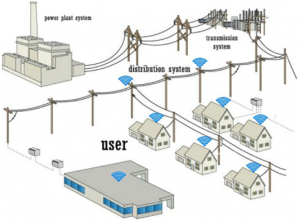 Energy and network data management system enables distribution companies remotely monitor the energy data. The data is collected wirelessly using industrial grade Pyrumas PLC (Programmable Logic Controller) which are fitted to the feeders, substations, transformers. Pyrumas PLC transmits data wirelessly to Pyrumas cloud which collects raw data, formats them and prepares the data for later analysis. The data can be viewed graphically using the web interface which allows the distribution companies to remotely send commands and monitor data. The Pyrumas energy management console keeps track of the energy distributed at different feeders, substations, transformers and the different houses/industries connected to a transformer. Pyrumas with its innovative technology has devised and successfully implemented the solution using RF and GPRS technology on sub-station feeder metering involving Data concentrator units and Meter interface units. MIUs collect the data at periodic intervals and transfers over internet to DCU which transfers the same to central server through GPRS. Intelligent modem/PLC offered at each of the DTR meter will transfer the data at predefined intervals over GPRS to central server.